The expEDIum Revenue Cycle Management (RCM) Solution is a technology enabled complete Healthcare Revenue Cycle Management & Medical/EMS Billing Services. 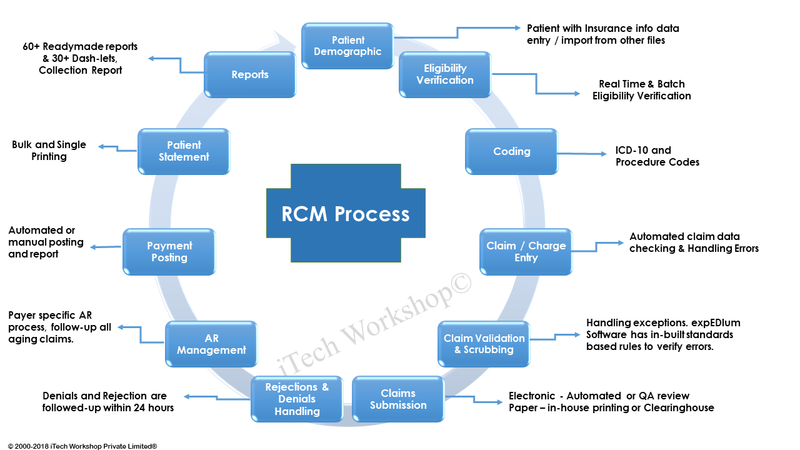 iTech expEDIum RCM is customized to meet particular EMS/medical billing services need by healthcare providers or partners. iTech RCM team have experience in working with several healthcare specialties including Ambulatory Surgery Centers (ASC), Behavioral/Mental Health, General Practices, OBGYN, Hospitals, Ambulance/EMS agencies etc. iTech work with Medical Billing Services Companies as an off-shore billing partner by providing them necessary resources and back office support that enhances their overall value proposition. iTech's Cloud based comprehensive expEDIum Medical Billing Software and Practice Management Software can combine with its medical billing services. expEDIum EMS Billing Software has several features that is designed to eliminate EMS billing errors & simplify EMS/Ambulance Billing Services. We ensure daily entry of the patient data to eliminate any medical billing delays. All data are entered within 24 to 48 hours of receipt. Insurance eligibility verification services of the patient in real-time or batch can send to several payers. Our expEDIum PMS has seamless Eligibility Features that connect to hundreds of payers including MEDICARE & MEDICAID. Prior Authorization of a particular service/treatment of the patient health informatics in real-time or batch can be performed. All claims/charges are entered within 24 to 48 hours of receipt in the system. We make sure all claims are sent to respective payers on time. Claims can fail due to one or more data errors or due to specific standard rules. We handle every exception occurred in the claims and work closely with your team to get necessary data. This keeps our first-time payer acceptance rate almost 100%. Submission of both HCFA-1500 and UB-04 primary paper or electronic claims to the Carrier/Payers on the same day or within 48 hours. Timely secondary claims submission with relevant primary COB and follow-up of such claims to get paid with respective payers. Our software has the capabilities to understand any pending secondary claims too. EOBs are posted on the same day or within 48 hours in the system so that it is always up to date for A/R analysis. If the payments are automatically posted, we verify the payments. Same day review of all rejected and denied claims and re-submission of it. We may need to coordinate with you if any of the data is necessary to be fill/replace on such claims. This is the most important part of our service. Our goal is to maximize collections and keep A/R to a minimum as possible. We perform various A/R analysis and quality checks every day. We work with BillFlash for the Patient Statements.